Sloan's Fine Art is located in Charlotte, TN. Artist Jon-Roy Sloan has been painting for the last twenty years. This has been very sporadic as he has been busy raising a family and various military commitments including two tours of Iraq. Mr. Sloan began painting portraits of Civil War re-enactors and soon moved on to Army of Tennessee themes and portraits of Civil War generals. Currently he is working on a collection that will reflect his experiences in Operation Iraqi Freedom. Mr. Sloan began his first serious attempts at painting while he was a Freshman in college. 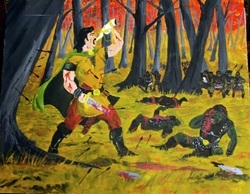 This is his interpretation of the Fall of Boromir from the J.R.R. Tolkien fantasy books The Lord of the Rings. He composed this completely out of his imagination without referencing any subject material. His second attempt was more ambitious. Mr. Sloan was influenced by the Fantasy-Master Frank Frazetta. This was a poor imitation but spoke greatly of the potential that was waiting to be unleashed. This emboldened Mr. Sloan to minor in art while in college to sharpen his skills with formal education and by associating with other aspiring artists. His third attempt was just as ambitious as his first. 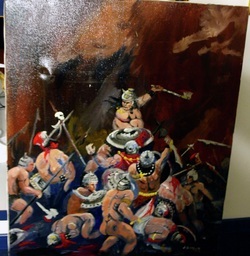 Mr. Sloan looked to other artists outside of Frazetta to learn more styles and compositions. 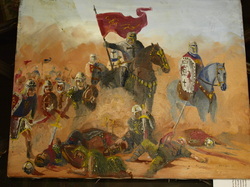 This is a copy of an album cover for the metal band Saxon, this album was titled Crusader. He took some liberties with this composition that better suited his skill set. Mr. Sloan continues to refine his skills and search for new inspiring subjects and materials. Due to the needs of making a living and supporting a family, Mr. Sloan is not a full-time artist and finds time whenever it is available to begin a new composition. Use this form to ask us a question or anything else. We welcome your questions and comments.